I’m often asked by friends, clients, and in email enquiries what it takes to build a successful blog. I’ve put together this guide on how to start a blog to help you understand everything from choosing what to blog about and setting up a blog, all the way to how to write engaging blog posts, and how to promote them. Part 1 – What should you blog about? Part 1: What should you blog about? Chances are, if you’re reading this post you probably have a good idea of what you want to write about. However, if you’re not sure what to write about, consider writing about something you’re extremely passionate about or can deliver a lot of value on. A lot of blogging gurus suggest that you should only start blogging about a topic if you can comfortably think up 50 individual blog post titles that you could write. While this is a good litmus test, in my experience it’s incomplete. I often blog about topic that I previously had no idea about. It’s said that teaching is the greatest way to truly learn something, and when you write informational blog posts, you are teaching. So for me, it’s less about how knowledgeable I am about a field and more about how passionate I am about it, and how prepared I am to learn. When I entered the world of music marketing, I knew very little about it – there was no way I could have come up with 50 headlines on music marketing. However, because I was so passionate to learn about it, I managed to build a blog with over half a million readers because I was constantly trying to learn new things and find new angles to write about. Don’t worry if you’re not an expert. You can use your blog to become the expert. Another consideration worth thinking about before you dive into creating a blog is what are you doing it for? 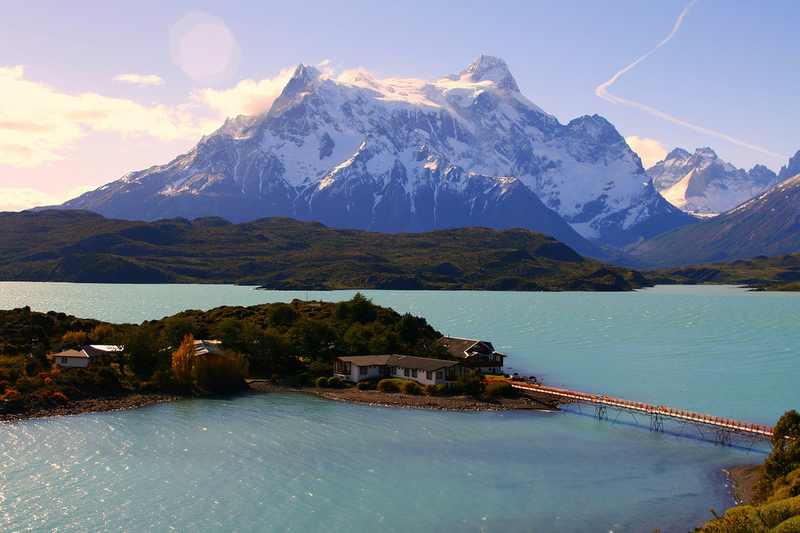 If you’re looking to earn passive income, don’t become a travel blogger. That space is so saturated that it’s virtually impossible for anyone except those who started pre-2007 to earn a living from it. My general advice is to carve out a niche that you believe you can be the best in the World at. It’s probably relatively easy to create the best blog in the world on Vietnamese cooking, but I imagine it’d be pretty difficult to create the best cooking website in the World. Start with a small niche, and work your way up. You will also need to make sure it’s a topic that you can stick with. In my experience, it takes at least a year of blogging once per week to get any kind of uptick in traction. If you can’t sustain a year writing about a certain topic, you’ll likely find it very difficult to gain a mass audience. When you know what you want to write about, it’s then time to create your blog. There are a few steps involved here; first we need to decide on a name for the blog, then we need to register the domain name, then we need to choose a blogging platform, and finally we need to setup hosting and install our blogging platform. Below is a step-by-step guide on creating a blog. When it comes to deciding on a name for your blog, anything goes really. I usually like to sit down with a pen and paper for half an hour and just bang out as many ideas as I can. If you find your self getting stuck for ideas, try using a synonym generator to come up with some other variations. Once you’ve decided on a name for your blog, it’s time to claim your domain name. 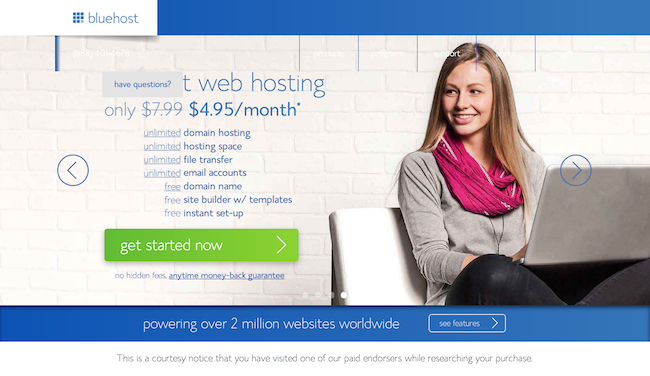 For most of the websites I run, I host them with Bluehost, who offer a free domain name for new websites. You can register your free domain with Bluehost here. Alternatively, if you decide not to use Bluehost, you’ll need to register your blog’s domain name manually. Most domain names cost about £10/year to register, so it’s not too expensive. Ideally, I’d recommend going for a .com domain name, unless you’re specifically targeting a geographical area such as the UK or Australia, in which case .co.uk or .com.au is fine. If you find that the .com is taken, I’d recommend going for the .co. If that’s taken, I’d go back to the drawing board with your domain name ideas. The next step is to decide which blogging platform you will use. I will make this one easy for you – the best blogging platform to use is WordPress. It’s used by over 78 million bloggers and is by far the best platform. It’s also free and has the best support, themes (designs), and endless customisability. Even this website is built on WordPress. If you’re curious, the other main alternatives include Blogger and Tumblr. While they’re both a bit easier to use and may seem more cost effective because you don’t have to pay for hosting or a domain name, like many things in life that appear too good to be true, they’re not really free. One of the main differences with Tumblr and Blogger is that you don’t get your own domain name, so your blog will be something like http://yourblog.tumblr.com, which looks amateur from the get go. You will of course have to pay a premium if you want to have a custom domain name. On top of this, the functionality is no where near as good as WordPress, and it’s much harder to generate visitors to a Tumblr or Blogger blog, for reasons that we’ll discuss in the final section of this post. Hopefully by this point you’ll have decided to proceed with using WordPress as your blogging platform. If that is the case, you’ll now need to set up a web host. Your web host is basically the storage space where you upload your website’s files to. I’ve written a guide on how to set up web hosts here before, but it’s relatively straight forward – you just need to go to a host like Bluehost and create an account (I thoroughly recommend Bluehost – I’ve used them to host many websites over years, and they’ve been great). Bluehost is relatively cheap and costs $4.95 / month to host your blog. This is the last expense (besides possibly a WordPress theme if you want to get a premium one) that you’ll need to incur to start your blog. 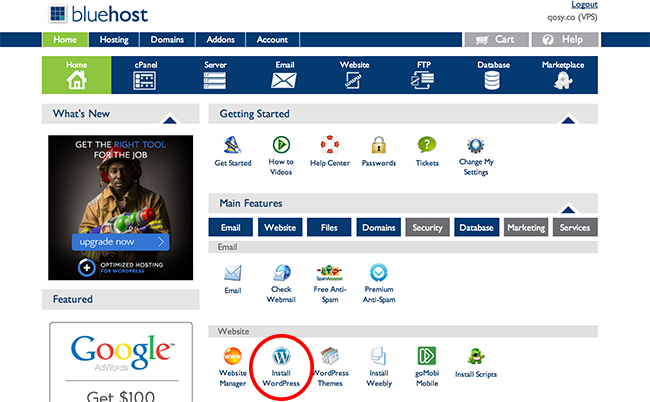 Once you’ve set up your hosting account, you’ll be ready to install WordPress with Bluehost’s one-click install function. Setting up WordPress is extremely easy when using Bluehost, as they are one of the only web hosting companies with a (reliable) one-click install function, which saves you having to worry about creating databases and making changes to your site’s code. Once you’re logged into your dashboard, find the button that says install WordPress (circled in the screenshot below). Click this and follow the instructions to install WordPress on your blog’s root directory. Once this has completed, you should be able to visit ‘www.yourdomain.com/wp-admin’, where you will be able to create an account on your website and begin designing and writing on your blog. After completing step 5, you will be able to create blog posts, but they might not look very pretty, as they’ll be using the default WordPress theme design. To make your website look beautiful and unique, you don’t need to hire a designer or have any coding knowledge, you just need to find a good WordPress theme. I recently put together a huge list of 109 amazing premium WordPress themes, which I’d recommend having a look at, as all of the themes in that list are responsive, which means that they also work and look great on mobile devices and tablets. You can usually get a great premium theme for under $40 or £25, and I’d say the small investment is worth paying as it’ll make your blog stand out, provide a good user experience, and it’ll make it easier to generate traffic to your blog. So now we’ve got our WordPress blog all setup and we’re almost ready to begin writing. If you have itchy feet, feel free to skip to the section on how to write great blog posts. Otherwise, I recommend getting your strategy right to begin with. Most bloggers write without strategy, which is comparable to attending a gym without having any specific goal. Sure, you will get some results, but you’d get the result you want much quicker if you had a strategy to begin with. Your strategy is the intelligence that guides how you make decisions, and how effectively and efficiently you reach your goals. Below are some considerations to make before you begin writing. Broadly speaking, there are two strategies for what type of blog content you produce; evergreen and news-based. News-based content is, unsurprisingly, highly relevant in the short-term, but will go out of date quickly. An example today might be ’21 Amazing Photos From the 2014 Melbourne Grand Prix’. There is no right or wrong strategy here, but I personally have a preference for evergreen blogging, as it lends itself to compounding traffic over time. If you’re writing news posts, it’s almost as if you’re treading water, because the traffic for one post will replace the drop-off in traffic for an old post. Whereas, with evergreen content each post accumulates traffic on top of every other post you’ve written. The benefit of news-based content is that it’s much easier to generate huge spikes in traffic, links, and coverage. Writing about the Melbourne Grand Prix is almost certainly going to generate you more traffic tomorrow than writing about yoga mats. However, in three months time it’s unlikely that your post on the Grand Prix will be getting much traffic at all. #2 How often should you blog? 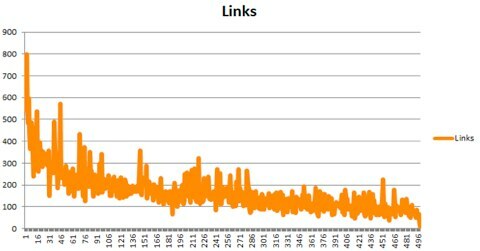 Blogging frequency is a widely debated topic with a plethora of good arguments supporting high and low frequency blogging. This is to say that there is once again no correct answer. I advocate a low-frequency approach, because I believe that content quality is becoming increasingly important. Better to have one exceptional post written per week, than seven mediocre ones. However, this works because I also believe in long-form content and an evergreen approach. If I were writing a news-based blog, low frequency simply wouldn’t cut it. Of course, the ideal approach is a high frequency of high quality in-depth content, but with limited resources there usually needs to be a trade-off between quality and quantity, and based on my experience, it’s better trade on the quantity. Ideally, I would say you should aim for a minimum of one post per week for one year. From this point you will be able to evaluate what impact an increased or decreased frequency would have on your blog’s growth. This frequency is usually quite manageable and balances enthusiasm, commitment, and results. This also raises another important point, which is the need for discipline over a relatively long period of time. I have worked on quite a few different blogs over the years, and i’ve never had a blog ‘break’ in less than a year. It takes time, and it can be heartbreaking to invest so much effort without much in the way of results for a long while. The trick is to stick with it, create a schedule, and stay engaged for at least one year. I’ve already mentioned my advocacy for long-form content, so let me explain why I choose to write posts that are typically over 3,000 words long. As humans, we associate content length with quality. An academic essay is probably more thorough than a children’s short story. Similarly, a 5,000 word article has probably had more blood, sweat and tears invested compared to say a 500-word article on the same topic. Because of this phenomenon, we are more likely to link and share a long piece of content. Google is more likely to rank a long piece of content above a short piece of content. In other words, long content generally performs better from every angle. 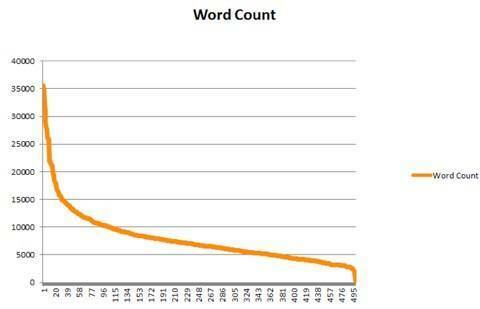 If you’re a stats person, Quicksprout did an interesting study comparing word count and the average number of links generated to an article. They also looked at word count and rankings. As you can see, there is a clear correlation between the two. The only caveat here is that long-form content is obviously a larger investment of time and effort compared to a short post. This once again comes down to your preference; would you rather post one incredible 3,000 word article per week or six shorter 500-word articles? This brings me on to a topic that’s very relevant to bloggers; writing productivity. While time management and productivity is beyond the scope of this post, i’ll touch on a few of the most impactful techniques that’ve enabled me to write large amounts of content relatively quickly. When I began blogging, I struggled to write a 700 word article in a day. Now I can write 2,000 words per hour on a topic that i’m extremely familiar with, or 1,000 words per hour for something less familiar. The Pomodoro Technique – this technique involves writing for 30 minutes straight with no interruptions and then having a 10 minute break, and then repeating this process. I use the stopwatch timer on my iPhone to go off after half an hour, but many bloggers advocate dedicated Pomodor apps or an old-fashioned kitchen egg timer. Fullscreen writing environment (FSWE) – one of my top tips for bloggers is to stop writing posts in Microsoft Word and start using a fullscreen writing environment, such as OmmWriter, WriteRoom (for Mac), or DarkRoom (for PC). FSWE’s work by eliminating all distractions. You cannot bold text, create headings, add links, or even view your computer’s usual notifications and menu bars. Using OmmWriter, I don’t write faster but I do write for longer without getting bored or distracted. Thinking in advance + free writing – I find the easiest way to knock out a post quickly is to spend a bit of time in advance thinking about the structure of the post and what you’re going to say. This ensures that when you go to write it, you’ve already done the hard bit. When it comes to the writing, I like to free write. That is, I like to write acknowledging that it doesn’t need to be perfect and that the first draft is to just to get my ideas on the page. This prevents you from lots of stopping and starting, and enables you to get the bare bones of your post out quickly. One of the biggest challenges with creating a new blog is getting the blog to become an authority. This will inevitably take time, but you can ‘leapfrog’ your way to the top with a few techniques. The first tactic is to associate your blog with the top names in your industry. The easiest way to do this is to interview the authorities in your niche. Very few people turn down the opportunity to be interviewed, and most will happily share your post with their followers. When I wrote this post interviewing 30 music entrepreneurs on their top piece of advice, it was shared over 800 times and enabled Venture Harbour to gain credibility in the music industry because for a few days we were everywhere, and we were being shared by many of the most respected industry celebrities. Another technique to leapfrog your way to authority is to simply look like an authority. We judge books by their covers, so make your cover good. This is why I recommend investing $40-50 in getting the nicest WordPress theme you can get your hands on. The boost in professionalism will certainly pay off in extra opportunities. One of the best books i’ve read on producing viral content is Contagious by Jonah Berger. While many social media gurus have their theories on what makes content shareable, Jonah has boiled it down to six empirically backed-up points that are easy to follow. The six aspects that determine how virally a piece of content spreads spell the acronym ‘STEPPS’. Social Currency – we prefer to look rich rather than poor, cool rather than uncool, smart rather than dumb. As such, we’re more likely to share content that affirms the traits we want others to see in us. Triggers – what’s on the tip of our mind is on the tip of our tongue. Over the long-run, toothpaste is more talked about than the time your boss walked into the office dressed as a pirate. While the latter is more remarkable, there are more triggers around toothpaste, so more word of mouth is generated about toothpaste. Emotion – we share things that provoke strong emotional reactions. Public – the more people that see your post, the more likely it is to spread virally. Practical – we share things that offer practical value. We all like to be useful and help our friends and family. In that way, posts that provide useful insights tend to perform well over the long term as people share them to help others. Stories – notice how we rarely talk to people in facts. Instead, we share stories. The next chapter of this guide is focused on best practices on how to write good blog posts, and how to determine what to write about. Below are some of the helpful tips and techniques for boosting the quality of your writing and the ‘fit’ between what you write about and what your audience wants to read. One of the best ways to approach blogging is to solve common problems that people in your industry will face. This might be through writing guides like this one, ‘how-to posts’, or by interviewing experts on how they tackle known issues. A lot of amateur bloggers begin blogging by focusing on themselves (writing a blog like it was journal). While there is nothing fundamentally wrong with this, it’s a difficult strategy for building up a popular blog. On the other hand, it’s far easier to generate significant amounts of traffic by focusing on solving common problems that your readers have. When deciding what problems to write about, I recommend using a handful of tools to determine which problems are more searched for than others. This takes us onto writing about what people are searching for. For the majority of blogs, Google represents their largest source of traffic. A generally smart strategy for building a blog is to reverse engineer this, and write content around the questions and topics that are most popularly searched for on Google. To do this, you can visit Google’s Keyword Planner and find the search volume of a list of keywords. You can slice and dice this data by location and how the term is searched for. For example, let’s say you’re building a blog on yoga. 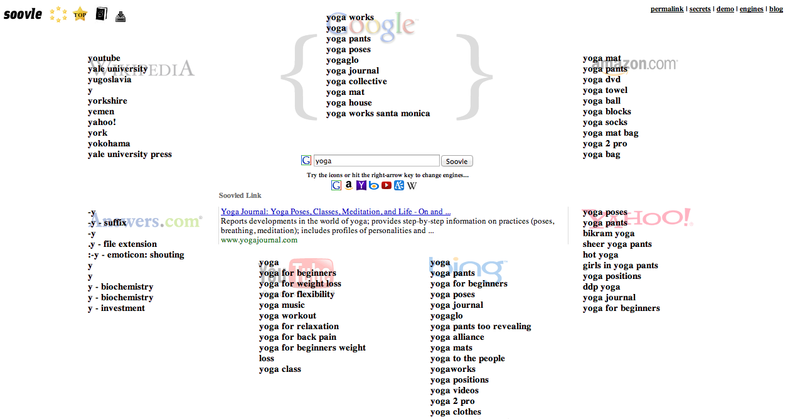 Here are some of the search volumes for different yoga related keywords. With this data on hand, you may want to begin writing a post on ‘A Guide to Ashtanga Yoga Poses’ as we’ve confirmed that ‘Ashtanga Yoga’ is widely searched for with over 74,000 searches per month, and is not overly competitive. Another way to find content ideas is to use an idea generation tool like Soovle or UberSuggest, which finds the most commonly searched for phrases and words around a keyword you enter. Below is an example of what’s outputted when we put in the word ‘yoga’. A good headline should blend descriptiveness and intrigue. It should make a promise about what’s in the post, while being interesting and honest. It works because it’s intriguing and descriptive. It’s honest and interesting. However, it’s also being overdone, and many people find this style very irritating (myself included). That said, I can’t deny that their headlines work. Why Did Google Launch Google Play Music All Access? Again, there is no right or wrong here – just best practices. One of my favourite blogs (Sivers.org) has a completely unique headline format, whereby most posts are two or three words long e.g. “Naive Quitting”. Remember, the opposite to what’s normal is usually where the most opportunity lies. I learnt how to blog by observing my old boss, Kevin Gibbons, who was responsible for growing the SEOptimise blog into one of the most popular SEO blogs back in 2007-2011. One of the things that made Kevin’s posts stand out was the amazing photos he used – even in posts that were relatively mundane. Flickr is a great platform for finding great photos. If you click ‘advanced search’ and select the creative commons option, you will be able to find amazing photos that are free to use, as long as you credit the photographer. Most people skim read blog posts. In fact, chances are you’re skim reading this post! Because of this, it’s important that you break up your posts with headings, subheadings, lists, and images to make it easy for readers to get to the parts that matter the most to them. One of the truisms of blogging is that creating a blog and writing the posts is less than half of the battle. The real challenge is promoting your posts and attracting a sizeable audience. While this topic deserves a post in itself, i’ll touch on some of the most important aspects of blog promotion. One of the most neglected aspects of blog promotion is building an email list. By having a list of thousands of people who you can notify about any new post you write, you don’t have to rely on people finding your post by accident. To get started with email marketing you’ll need a tool for building a list and emailing subscribers. I’ve reviewed some of the different email marketing software providers here. I’ve touched on the importance of Google and SEO a few times in different parts of this post already. As the go-to place for answering questions and discovering content, it’d be foolish to ignore Google as a blogger. SEO can generally be categorised into two major categories; on-site SEO and off-site SEO. On-site SEO is about how relevant your blog or post is to certain keywords or search phrases. Off-site SEO deals with how popular and trustworthy your post is relative to other similar websites or posts on the same topic. In practical terms Google has over 400 individual ranking factors, ranging from page loading speed, content freshness, content-length, down to the number of broken links on your site, and the quality of websites linking to your site. I’ve spent the past six years understanding SEO in as much detail as I can, and have worked on hundreds of campaigns for clients as large as Vistraprint, Miele, Tetley, and Reed. While it is a complex alchemy, you can understand 90% of what impacts search rankings by simply making your content as relevant to what you want to rank for, as helpful as to your users as possible, and as popular as possible. Virtually all ranking factors stem from these three components. If you’re interested in learning more about SEO, I recommend reading Moz’s beginner guide to SEO. When you start out, you probably won’t have a very large audience. To leapfrog your way to the top, leverage other people’s audience through guest blogging. Want to reach tens of thousands of SEO professionals? Write a guest post on YouMoz. Want to reach tens of thousands of music industry professionals? Write a guest post on MusicThinkTank. Leveraging other people’s audiences is one of the fastest ways to build your own audience. Think about many music artists who have become famous very quickly – often they used a strategy of collaborating with lots of other well-known artists. Lots of YouTube celebrities gained their fame through covering popular songs. This is exactly the same concept, whereby they’re leveraging the audience of other popular people to build their own audience. Social media platforms give you back what you put into them. Twitter is one of the most powerful marketing tools on the planet, yet it won’t bring you much more than a handful of retweets if you just publish your content to your feed once a week. The power of these platforms, in my opinion, is in developing relationships. Never has it been so easy to reach out to someone of authority who lives on the other side of the World and arrange a quick call to introduce yourself and line up some collaborations. Never has it been so easy to enable hundreds of people who enjoy your writing to tell all of their friends about it. When it comes to social, remember that it’s a means to an end. Use it to build the right relationships, and use it as a way for people who enjoy your work to keep up to date with what you’re writing. When you fully understand what triggers content to spread virally or encourage journalists to cover stories, you will find it much easier to generate publicity around your blog and reach a six or seven figure audience for your blog. The general tip here is to write or do things that are remarkable. By definition, we remark on things that are remarkable. Remarkable things tend to exist at or beyond the extremes of what we consider normal. The largest, smallest, richest, poorest, heaviest, lightest, tastiest, newest, and oldest. These are the things that tend to constitute remarkable. Produce remarkable stories and you’ll have no problem attracting a large audience. Starting and growing a blog isn’t easy. It’s an uphill battle at the best of times, but ultimately the pay off can be great. While this post may be overwhelming, I recommend using it as a guide as you embark on building your blog, and returning whenever you get stuck and need to get to the stage. If you haven’t yet created your blog, the best thing you can do right now is to take a baby step and start. If you already have a blog but aren’t seeing much growth, you may need to re-consider your strategy and try something new. Whatever the case may be, if you have any questions feel free to post them in the comments below or contact me on Twitter, and i’ll be sure to do my best to help.